Ever wondered if an iOS Setting was turned off or on? Don’t want to go fishing around in Settings of iOS to see if something is enabled or disabled? Maybe you’re away from your device and want to know a settings status using Hey Siri? You don’t always need to dig around in the Settings app or have direct device access, because sometimes Siri can inform you of how a particular setting is toggled on your iPhone or iPad instead. Is Do Not Disturb enabled? If the setting is enabled or disabled, Siri will report back the status of the setting, and also show a toggle switch which allows you to change it if so desired. Keep in mind you can also ask Siri to change settings for you, which can be just as useful as well. There are many settings you can inquire about, but some are either sent to the web or to a Siri referral rather than directly addressing the question. 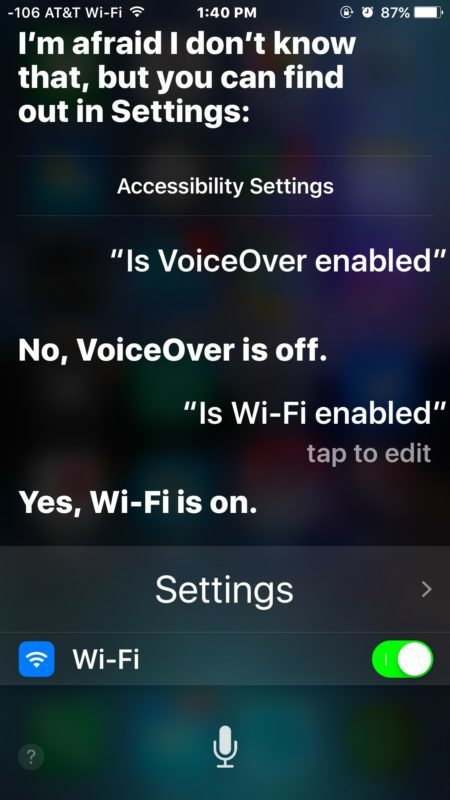 That inconsistency may be a little annoying, but if you want a lot more leeway than remember you can go about opening specific Settings in iOS with Siri which works for virtually any setting on the iPhone or iPad, even ones that Siri is not capable of directly reporting the toggle status of. So, the next time you’re wondering if a setting is enabled or disabled on a particular iPhone or iPad, just ask Siri. It just might work. And if it doesn’t, just ask Siri to open the settings that you’re inquiring about instead. …too lazy to work through ‘General’ and ‘Privacy’? …confide in her with your secret thoughts, desires? …every interaction resides at Apple servers…Siri’s got you! …turn her off and your indiscretions will disappear. Siri ain’t worth trusting. Siri – Turn Siri OFF. Agreed. I cannot find a use case for Siri. I bought the first Samsug with voice talk. What a disaster! (Look it up sonetime). That is what drove me to Apple. Siri was an improvement, but not by much.